Experimental recharge mechanism. Introduced energy weapons, which recharge from personal batteries! Currently includes laser rifle, laser sniper rifle, laser shotgun, laser machine gun, mega laser cannon, chainsaw. We have electric-powered laser turrets. We have electric-powered personal laser defense equipment. Now we also have electric-powered weapons! Just craft these electric-powered weapons. No need to craft any ammo. Equip them in any gun slots, "ammo" (called charges in this mod) will be generated automatically! Note that the charges do not come for free! Each charge costs energy, and energy is taken from personal batteries in the armor grid. You will need at least one personal battery equipped for these weapons to recharge. Normally, these recharging will take place automatically, whenever guns are (un-)equipped or ammo are drained. But in case charges are not full (e.g., after ran out of battery), you can always do a manual recharge by clicking on the shortcut "Recharge energy weapons". Energy required for various weapons are different, as shown by "Shot energy" in the weapon info panel. 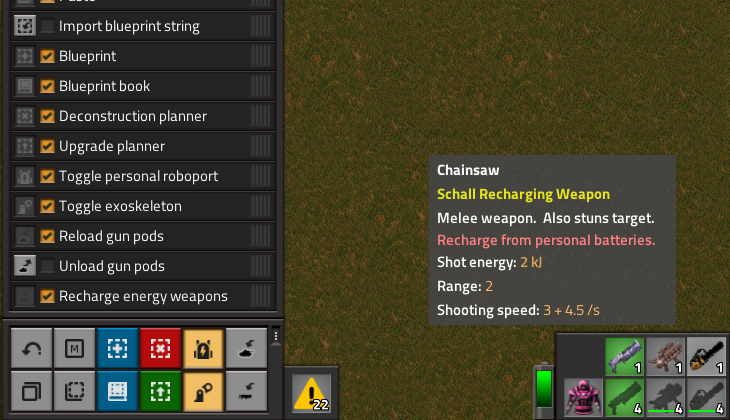 For example, chainsaw uses only 2 kJ per attack, so can easily powered by a portable solar panel; while heavier guns can take like 5 MJ per shot. So be sure to equip more personal batteries or bring some backup ammo weapons, if you plan to use them a lot or for sustained combat. For more details and stats of the weapons, please see the FAQ section. Schall Alien Mutation has introduced some laser-resistant against these new laser weapons. You would need them for some challenges, do you? Schall Endgame Evolution has introduced some stronger aliens at the endgame. They would make excellent targets (or as predators...) for your new toys. Schall Alien Tech has introduced another two Doom weapons: plasma rifle and BFG 9000, though they are "ordinary" weapons that operate on ammo. If you like this mod, and would like to provide other translations, please do not hesitate to send me a message. Tribute to the classic game Doom. Graphics and sound effects of chainsaw are materials extracted from the game. Tribute to the classic game “UFO: Enemy Unknown” (aka. X-COM: UFO Defense). Graphics of laser rifle, laser machine gun, and mega laser cannon are materials extracted from the game. Credit to Final Mod Pack of the open-source game OpenXcom. Graphics of laser sniper rifle and laser shotgun are materials derived from the mod, permission granted by Solarius Scorch. More details in FAQ section.